As Manchester grows, areas outside of the city centre that formerly just catered for residents are becoming destinations in their own right. The Heatons - in particular Heaton Chapel and Heaton Moor - have been part of this following a spree of recent openings. Here's five places worth visiting - featuring food, beer and an independent cinema. Inspired by their grandfather's 1920’s Brooklyn-based Deli, Back’s is essentially a cave for all good things that any food/drink-loving person would want to consume. Whether it be smoothies, sandwiches, cheese, wine, beer, fresh fruit or pies, this place has you covered. A favourite among discerning locals, this deli really does deserve wider acclaim for its homemade produce. Bottle, as the name suggests, has a plethora of bottled and canned beers available all laid out on their wall of craft goodness - featuring overseas beers from the likes of Mikkeller, and To Øl alongside UK favourites like Wild Beer and Thornbridge. But that's not to say that Bottle isn’t a drink-in establishment; with seven keg taps it has more than enough ammunition for the thirsty traveller. Owner Corin has also put a lot of thought into his cocktails selection if you can bare to turn yourself away from the wall of beer. 9A Shaw Road, Heaton Moor. 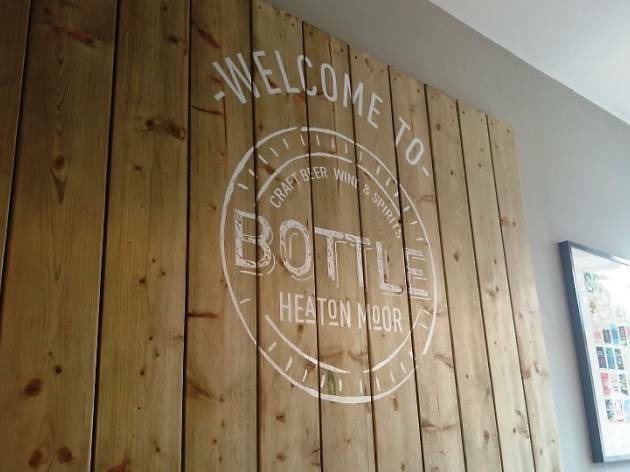 A 'top five' list with two craft beer tap house/bottle shops in it may seem like the ramblings of a booze addict – and whilst that isn’t incorrect, there is plenty to separate these two saviours of beer in the Heatons. Owners Damian and Charlotte have put together a cosy and stylish bottle shop and tap room that aesthetically feels more like a bar with its eight keg lines and 2 cask pumps. It features celebrated UK breweries such as Weird Beard, Beavertown and Kernel alongside more local options such as Marble, Red Willow and Tweed. Despite opening six days a week, Heaton Hops also offers features a flagon fill station if you really can’t make it through Monday without 3.2 pints of your favourite beer. 7 School Lane, Heaton Chapel. Time for some Heatons history; Nook takes its name from the field it is built on (Owler Nook) which once meant 'Sheep Smugglers' Hide Out'. Sheep smuggling aside, Nook is also bringing a home for artisan coffee (Union Roasted to be specific) to Heaton Moor; although the area has a lot of places for a cuppa it has always lacked passionate baristas with an enthusiasm for coffee. They’re promising loose-tea infusions, smoothies, veggie juices, handmade ice cream and sweets – in short, a mix of the healthy and heavenly. With a planned opening in early November, Nook is set to bring to life to one end of Heaton Moor Road that has felt a little quiet compared to its bustling neighbours. Built in 1920, the Savoy is a slice of history that has felt somewhat tired and neglected in recent times; with the corporate giants looming just down the road in a chain-eatery, family-‘fun’ megaplex it may have been feeling the squeeze but mercifully a family team famed for refurbishing two cinemas in the Midlands are waving their magic wand. The planned opening is on the October 23 and they’re promising big films and live satellite broadcasts so expect the likes of Bond and Benedict Cumberbatch in Hamlet. As for refreshments there’s going to be a fully stocked bar with beer, wine, cakes, nibbles and ice cream to accompany you in your viewing pleasure. See more things to do in Manchester from Time Out. Tom is a hands on blogger, drawing on his work with local micro-breweries for insights. He has been writing about music and drinks for a whole host of people and blogs at Full Fat Ingham.